Avert your eyes from all the white stuff outside. 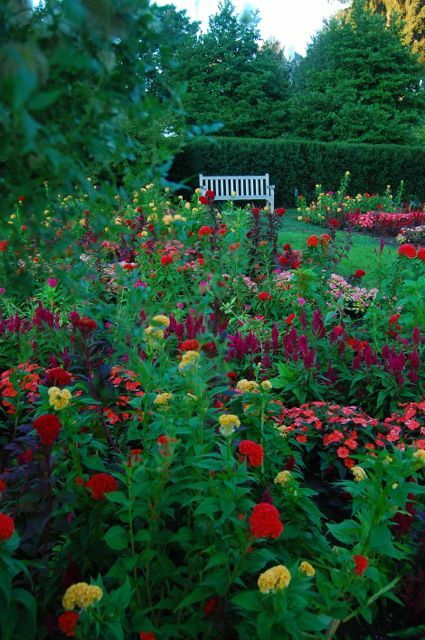 Let’s you and I have a cozy sit, and think about gardens – and how pleasant to do so on a well-placed garden bench, the subject of this Friday Idea File. 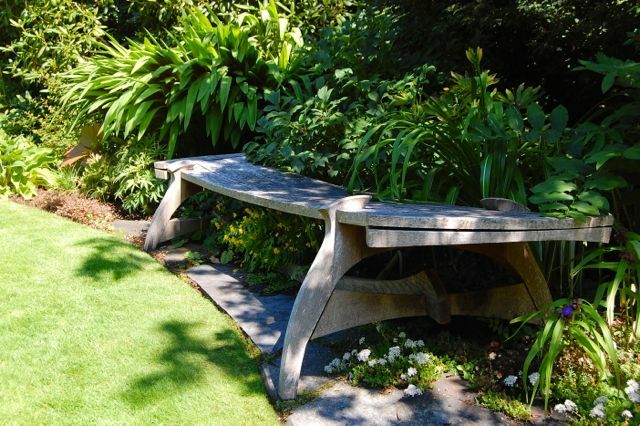 A bench in the shade (or sun, depending on your mood) is just the spot to percolate the ideas you’ve gathered walking around a garden. So grab a reviving beverage and join me. Why settle for simple stone, if you can have one inlaid with a pearlised flower to match your ‘Rozanne’ Geranium? 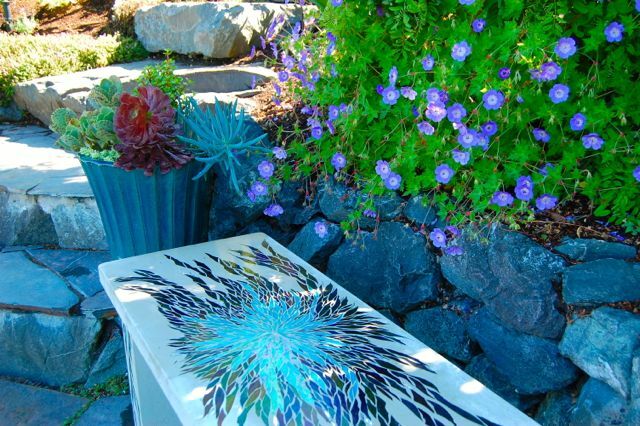 The inlaid concrete bench above, by California’s Hidden Spring Designs, was spotted in the garden of Christopher and Michelle Epping in Seattle. 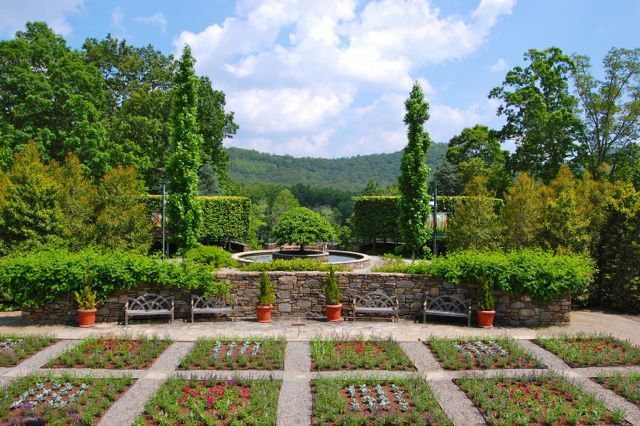 Sit here for a spell, and imagine a fabulous hilltop view. 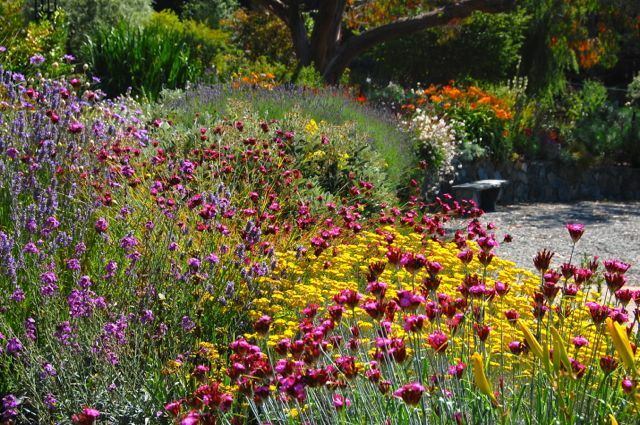 Besides being places to veg, converse or dream, benches – especially bookended by planters – make attractive garden features in themselves. They’re (relatively) inexpensive, functional garden art. Every garden needs a place to stop and rest, even if simply a flat stone or stump. How about yours? A formal mini-terrace overlooks Toronto’s bluffs. 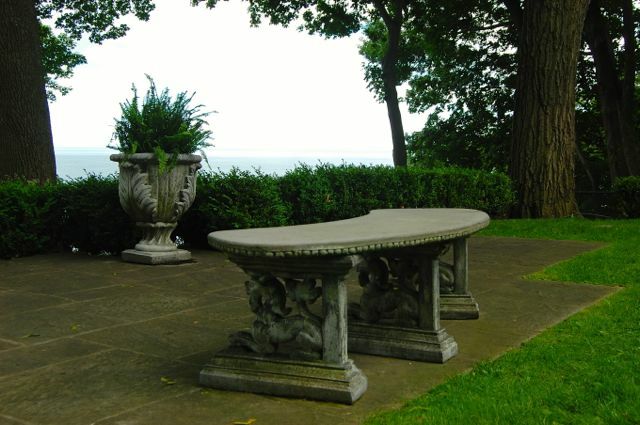 Sit here, and forget about the vast lawns that need clipping behind you. Let’s get a closeup of the bench we featured in our Idea File on Garden Sheds. 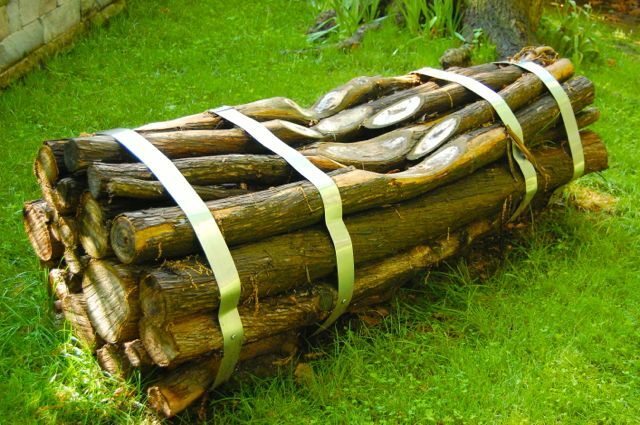 Couldn’t find the source of the log bench above – contact me if you do. But, if reclaimed wood claims a place in your heart, Toronto is home to great makers like Stroudfoot and Urban Tree Salvage. Adding a bench or few makes for highly social seating, where it’s easy to squeeze in another guest. 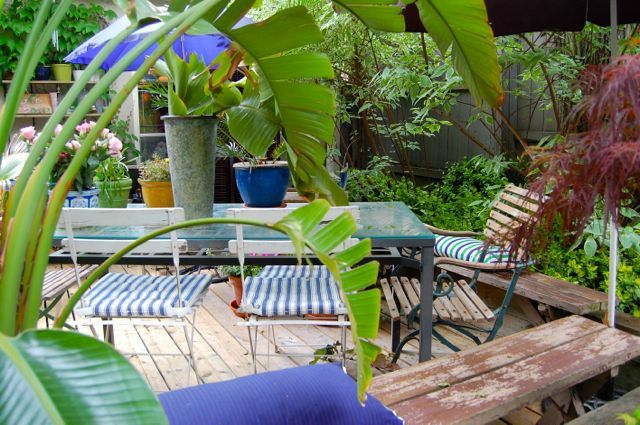 The Toronto garden above is the perfect party central. The slender form of the bistro chairs and the glass-topped table ensure the space feels uncongested, even when packed with people! Pass the vino. Early-morning exuberance at the Indianapolis Museum of Art, just as an antidote to today’s big snow. The simplicity of the white bench above is respite for the eye as well as the bones. After you’re done with shovelling the walk (again! ), take a seat and dream. 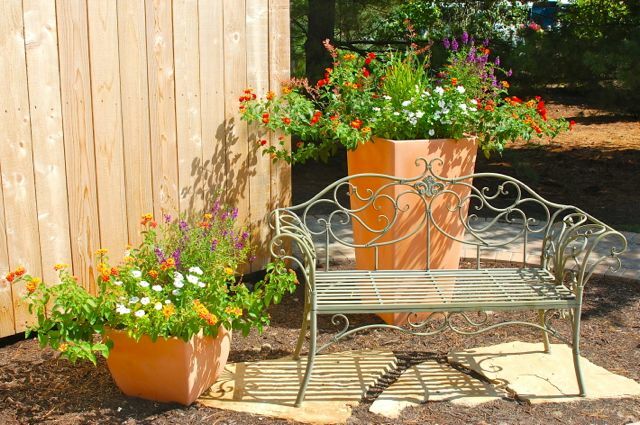 For more, more, more garden bench ideas, check out this album on our Toronto Gardens Facebook page. Then tell us your garden bench stories. Thanks, Jeannine. 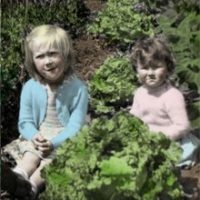 I'm looking to install something seat-ish in my garden, myself. I've been wanting to paint the rustic bench that Sam, Helen's son (my nephew) made on my 50th birthday. It's made of two tree stumps and slats of wood on top. I'm thinking blue, what think you?